Murray Dueck received his Bachelor of Religious Education from Columbia Bible College. He was an Associate Pastor at Valley Christian Fellowship for seven years. During that time he planted a youth church called God Rock, developed its home group structure, and did itinerant ministry. Murray also oversaw the prophetic ministry in the church during those years, mentoring and discipling prophetic people. Since that time Murray and his wife began Samuel’s Mantle, a training program to help people hear God’s voice. For those of you who have heard Murray speak, you will experience how much the presence of God in his life means to him. Murray currently is writing, doing itinerant work, and teaching Samuel’s Mantle. He is the author of ‘If This Were A Dream, What Would It Mean?’, (great book but currently out of print- but you can receive the training from this book). His newest book is called, “Keepers of the Presence”. The book’s goal is to become your roadmap to developing your unique gift of spiritual sensitivity so you can steward the presence of God wherever you go! I have just ordered a copy for myself and can’t wait to read it. Murray has generously donated a book for someone who writes about their experience of using the contemplative way he has posted. You can review Samuel’s Mantle’s great training and order his new book at www.samuelsmantle.com. I am pleased to introduce you to someone whose teaching has impacted my spiritual journey in such a positive way, Murray Dueck. Enjoy his posting! Many of you know this little prayer “Lord Jesus Christ Son of God, have mercy on me.” And there are a few variations, including a very short one “Lord, mercy.” And I am going to assume here if you are reading this blog you know all about breathing, attention, repeating the prayer, etc…so I am going to focus on an aspect of the orthodox model that often gets over looked. This aspect is the factor of where in our being the orthodox fathers would like us to say our prayer from – our nous. (aka Our inner man), which dwells in our heart. In the Orthodox view it is our heart that steers the ship of our being, (and I think we would agree with that as we are to Watch over our heart with all diligence, for from it flows the spring of life (Prov 4:23). However in our heart, in the orthodox view is the core of our being – our ‘nous.’ We would equate the nous with the ‘inner man’ however the concept is a bit of a difficult concept to grasp, and I must admit I am still struggling with it. But here is the definition given out of the philokalia (a five volume collection of the writings of the desert fathers from approx the 4th to the fifteenth century). Intellect – nous – the highest faculty in man, through which – provided it is purified – he knows God or the inner apprehension of spiritual perception. Unlike the dianoia, the intellect does not function by formulating abstract concepts and then arguing on this basis to a conclusion reached through deductive reasoning, but it understands divine truth by means of immediate experience, intuition or simple cognition. The intellect dwells in the depths of the soul. It constitutes the innermost aspect of the heart. The intellect (nous) is the organ of contemplation, the eye of the heart. Let us try this another way as that last exercise may have been a bit weird for some of you: I want you to pray for someone, someone you really love, that you hope the best for and care about. Pray for them for thirty seconds (again, no peeking)…and point with your finger to where you were experiencing that prayer. More than likely your finger went to your chest – as you have discovered something going on in your inner man. It may be good before we move on to application to think of a few other ways we experience this (to make sure we include everyone). Have you ever been in church during an open mic time – and you just knew it was your turn to go up front and speak– but you didn’t want to go up? What part of you was arguing? If you could point with your finger where were those argumentative thoughts happening in your being? Now where did you feel the tug of the Lord drawing you to go up front and speak? Most likely in the inner most man – in the heart or chest. This is not as strange an experience as it may seem. When you have made a big decision in your life and you had to wrestle it through you probably needed to come to peace in your heart. Even though your mind was throwing out all kinds of options in regards to your situation it was in the inner man you needed to find that rest. For the orthodox contemplatives – it is from this place they pray. Here is an extract from the Philokalia written by Callistus Patriarch of Constantinople around 1360 AD. 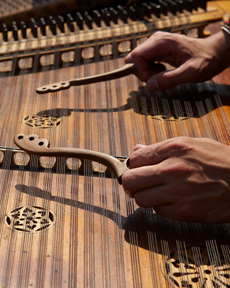 If you wish to pray as you ought, imitate the dulcimer player; bending his head a little and inclining his ear to the strings, he strikes the strings, skillfully, and enjoys the melody he draws from their harmonious notes. Is this example clear to you? The dulcimer is the heart; (where the nous is), the strings– the feelings, the hammer- remembrance of God; the player—the mind. By remembrance of God and of Divine things the mind draws holy feelings from the God-fearing heart, then ineffable sweetness fills the soul, and the mind, which is pure, is lit up by Divine illuminations. The heart, in this model of prayer, as we practiced pointing our finger earlier – is the focal point of the contemplatives attention. When about three weeks had passed I felt a pain in my heart, and then a most delightful warmth, as well as consolation and peace. This aroused me still more and more and spurred me on to give great care to the saying of the prayer so that all my thoughts were taken up with it and I felt a very great joy. From this time I began to have from time to time a number of different feelings in my heart and mind. Sometimes my heart would feel as though it were bubbling with joy; such lightness, freedom, and consolation were in it. Sometimes I felt a burning love for Jesus Christ and for all God’s creatures. Sometimes my eyes brimmed over with tears of thankfulness to God, who was so merciful to me, a wretched sinner. Sometimes my understanding, which had been so stupid before, was given so much light that I could easily grasp and dwell upon matters of which, up to now, I had not been able to even to think of at all. Sometimes that sense of a warm gladness in my heart spread throughout my whole being and I was deeply moved as the fact of the presence of God everywhere was brought home to me. Sometimes by calling upon the name of Jesus I was overwhelmed with bliss, and now I knew he meaning of the words “The Kingdom of God is within you”. Here are the steps to this model of prayer. And again it is another style, and don’t feel constrained by it. But for me, it has revolutionized my life. What ‘Pilgrim’ describes above is the true fruit of this prayer and I would recommend to all of you who are interested this wonderful little book “The Way of the Pilgrim” as a great starting point to practice the Jesus prayer from an Orthodox perspective.